The ATEM Television Studio Pro 4K model adds Ultra HD capability with 8 independent 12G-SDI inputs, handling all popular HD and Ultra HD formats up to 2160p60. Each input features re-sync as well as a full low latency standards converter so input is automatically adapted to the switcher’s format, which allows 8 inputs, all running different video formats! The upgraded Fairlight audio mixer features dynamics, 6 band parametric EQ, dual mono channel split and stereo simulator with audio delay on the analog inputs. Features include the ATEM Advanced Chroma Keyer, Ultra HD multiview and motion clips in the media pool! These are full HD (1080P) DLP ultra-short throw (UST) projectors outputting 4000 lumens, with a 20,000:1 contrast ratio. Full 3d support. Fixed throw ratio of 0.25:1. These are full HD 1080P DLP ultra-short throw (UST) projectors outputting 4000 lumens, with a 20,000:1 contrast ratio. Full 3d support. Fixed throw ratio of 0.25:1. Full support for Crestron Roomview, Telnet, Extron IP Link, AMX dynamic device discovery and PJ-Link protocols, allow almost all aspects of the EH415 to be controlled across a network, keeping you in control, wherever you are. The environmentally friendly EH415 has energy saving features including Eco+ lamp power management, under 0.5W standby mode and auto power off, saving you both time and money. Our unique Optoma Colour Guarantee ensures hassle-free, long-lasting projection. 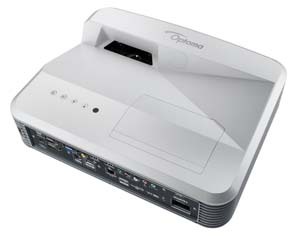 3D Support: Full 3D - The 3D features of Optoma projectors can only be used with compatible 3D content. Typical applications include use with 3D educational or 3D design and modelling systems. 3D TV broadcast systems, (SKY in the UK), Blu-ray 3D™ and 3D games from the Sony® PS3 or Microsoft® Xbox 360 are now supported as part of the HDMI v1.4a specification. These are full HD 1080P DLP Ultrashort Throw (UST) projectors outputting 4000 lumens, with a 20,000:1 contrast ratio. Full 3d support. Fixed throw ratio of 0.25:1.